Guitar lick with legato in one string by Alejandra! 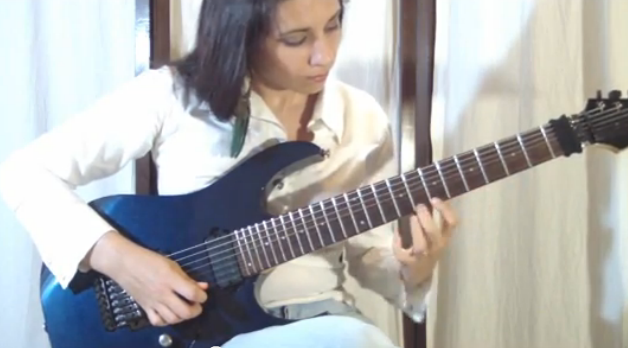 Check out the new lesson from our female guitarist Alejandra Mesliuk! She will teach you a cool legato lick in one string… Have fun! Holy smokes!!! Alejandra, you’re amazing! I’m rather mediocre, but I’m getting better … thanks to you and Claude! Joe Satriani uses the slide legato technique a lot, awsome lesson. Great to see a talented female guitarist! Its important for girls who are budding guitarist to have positive female role models who play all styles of guitar. Cool lesson, thanks! That was super nice and fast, I wouldn’t know where to play that. Suggestion regarding Alejandra’s previous lesson on alternate picking. It might be extremely helpful to provide students with the complete down/up stroke pattern for the entire lick rather than stopping at measure three. Plus, I think it’s also a good idea to provide the suggested left hand fingerings for the entire lick. These suggestions might prove to be extremely helpful to our students, especially in the higher registers. Thanks. That was good stuff you have a boyfriend!